Post Beep Beep cereal never made it to grocery stores. It was developed to the point that a scratch commercial was created consisting of filmed story boards with a narrator's voice over and cartoon sound effects. While we don't know if an actual edible cereal was ever created, the mock-up commercial indicated that Post Beep Beep would have been a crisp corn cereal flavored with brown sugar and honey. The cereal was referred to as The Road Runner cereal. 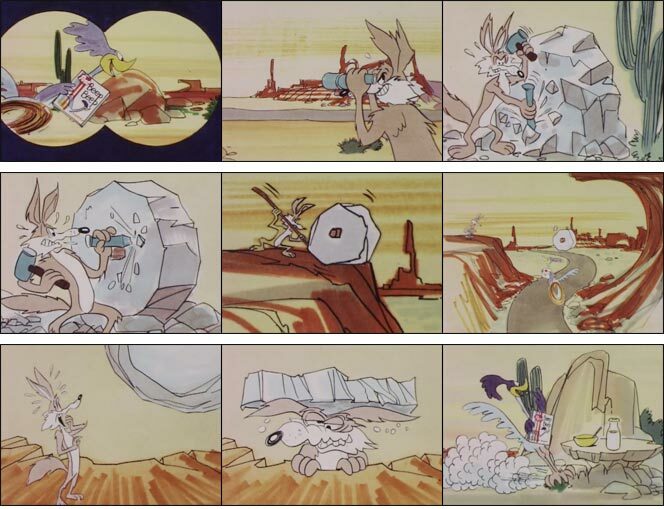 The characters of The Road Runner and Wile E. Coyote were created in 1948 by animation legend Chuck Jones. 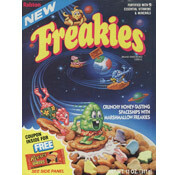 If you have any information regarding the year this cereal was in development, please leave a comment below. In usual Road Runner fashion, Wile E. Coyote tries to catch The Road Runner using unorthodox methods of hunting (ie. rolling chiseled rocks and painting fake train tunnels). 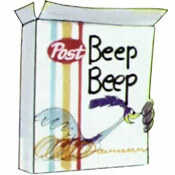 Only this time, The Road Runner is carrying a box of new Post Beep Beep cereal - stopping mid-commercial to enjoy a bowl. 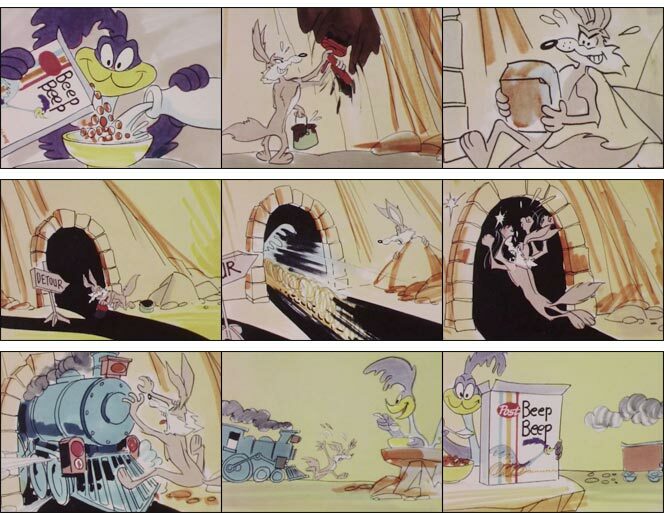 As the narrator speaks, the cereal name (Beep Beep) is interjected via The Road Runners famous two-word sound effect. Narrator: "Hey kids... have you heard about the new Post cereal? It's called Beep Beep. That's the name of it. It's an unusual name for a cereal. Post named Beep Beep after The Road Runner. It's so good - it makes you feel as frisky as The Road Runner. There's a crisp corn cereal with brown sugar and honey. It's honey-ed up for energy and sugared up for go. You can snack or splash on milk and eat Beep Beep out of a bowl. New Post Beep Beep... there's never been a cereal like it. They're honey-ed up for energy. They're sugared up for go. New Post Beep Beep - The Road Runner Cereal. Say Beep Beep in the morning. Have Beep Beep for breakfast. You can be a Road Runner too." What do you think of Beep Beep? I stumbled upon the scratch on YouTube and was curious. This is my first stop. If, in fact, the narrator for this ad is the great, and very consistently working, William Conrad it would have been made before 1971. The success of the television series Cannon all but ended his narration career. Because the scratch is in color, this presumes it was made after 1966 when almost all television production went to color, probably somewhat later. The potential presence of Mr. Conrad leads me to wonder if the scratch was made by Gamma who did most of Jay Ward's animation into the 1970s, although I am almost certain Ward never had a relationship with Post. One man's opinion is that the scratch was made between '67 and '71, possibly by Gamma Productions. One alarming feature is just how off-model the characters are. Very cool. I would have tried it. If you have any information regarding the year this cereal was in development, please leave a comment below: Well it was between 1947 and 1949. The world was just settling into the post world war 2 land grab, and the Fresh Kills Landfill had just opened! Monkey astronauts. The Indians won the World Series. Lil known dood named Gandi was assassinated.